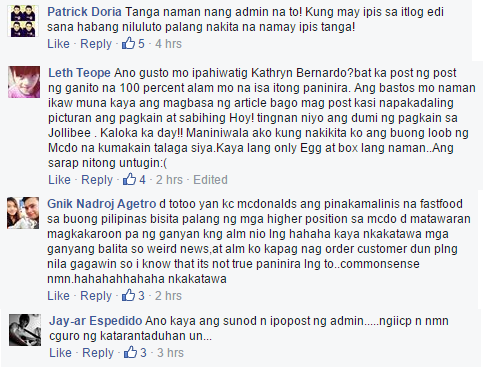 Teen star Kathryn Bernardo, a certified KFC endorser, has apparently shared a negative report against McDonald's via her verified Facebook fan page. "Pagkatapos ng worm sa burger, cockroach naman sa itlog. Haist~~" was the Kapamilya star's status message to her more than nine million FB followers. 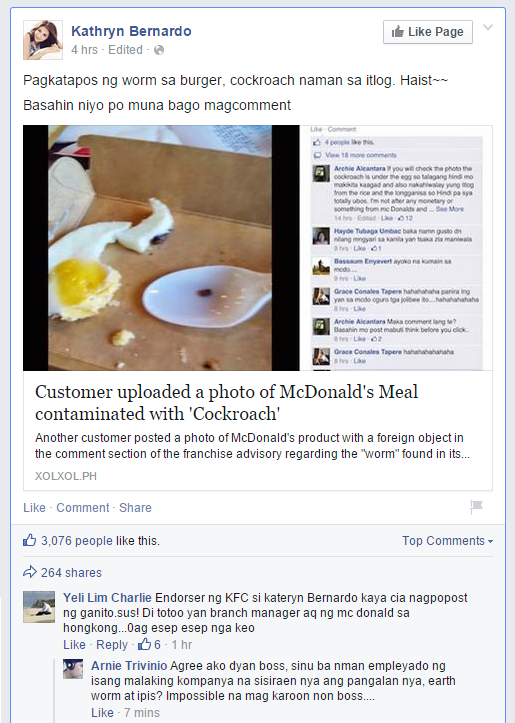 The link Kathryn shared is a news item titled "Customer uploaded a photo of McDonald's Meal contaminated with 'Cockroach'" from a Filipino blog called xolxol.ph, a site owned and managed by one of the two administrators of Kathryn's fan page. The headline is slightly different but the story is a revised version of a blog post we published earlier. A certain Yeli Lim Charlie, who claimed to be a branch manager of McDonald's in Hong Kong, belied the report and noted that Kathryn is a KFC endorser which, the Facebook user said, is the reason why the young actress shared the negative report against a competitor. As of this posting, the link with screenshot got more than 3,600 likes and hundreds of shares and comments. However, it seems the actress is gaining more bashers and haters because of the post. Since it's a VERIFIED Facebook page, it is assumed that Kathryn granted permission to the page admin to share the link. However, instead of promoting her, the page has somehow created a bad image for the actress. This incident is similar to the 'iPon Para Sa iPhone' controversy involving the YouTube love team sensation Jamich where a page administrator apparently caused trouble for the famous couple.